Forging(Hada): Forging is conspicuous ITAME and MOKUME hada with flowing indication.The surface is covered with sparkling Ji-nie glitter to show mottled Yubashiri isolated reflection as well as spilled temper of Tobiyaki. Temper(Hamon): Hamon forms wide undulating Notare in general mixing with irregular Gunome outline that glows with thick sparkling hard metal granules. Some isolated temper Yubashiri splits over the surface and Muneyaki temper appears clearly along the back ridge. Boundary area is active with curved mark of KINSUJI and SUNAGASHI. SomeYOU of floating quench dot appears in the interior of temper. Temper of tip(Boshi): Temper of tip is strong hard metal granule base,irregular outline with strong Hakikake thick lines of Nie brushing to form like a blaze. Tang(Nakago): Nakago is in UBU original. Shallow slanting left file marks. Two peg holes. Single-bevelled (Kurijiri) heel shape. Back ridge of Nakago is flat. The signature in front is six character that reads Bishu Osafune SUKESADA 備州長船祐定 and the other side is chiselled with the date of year In the 8th month, Tenbun 24th 天文廿二二年八月. 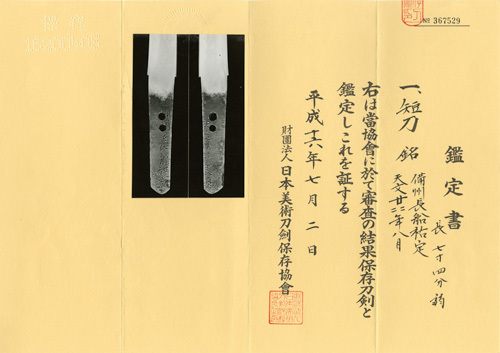 SUKEASADAs 祐定 in Osafune, Bizen province during Muromachi period was one of the most famed greatest sword makers lined up with 勝光 KATSUMITSU and 清光 KIYOMITSU. The subject cool Tanto is designed for the important equipment for an armored worrier - smart and neat, sharp tip, inward curve and a bit longer side palm grip sized tang which is suitable for stabbing into the gap of armor suit. Gold foiled copper ground Habaki collar. Preserved in Shirasaya mounting. Condition scale: very good (using a scale of mint-excellent-very good-good-fair-poor). Gold foiled single layer copper ground Habaki collar. Preserved in Shirasaya mounting.